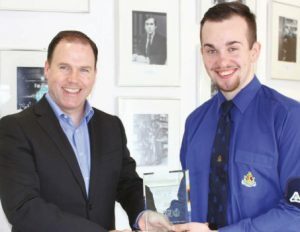 Alan Graham a member of 1st New Monkland Company was presented with the Make a Difference Award by STV news stalwart and former BB member John MacKay. Alan received the national honour in Scotland for helping others in his local community where he carried out in excess of 250 hours at Airdrie Foodbank. He was joined at the presentation by Company Captain Calum McLeod and Fiona Curtis, Volunteer Coordinator of Airdrie Food Bank. His volunteering efforts are going towards his Queen’s Badge and he is set to attend KGVI at Carronvale this summer. Nominations for the 2017 awards closed at the end of June and details on the winners will be announced later this year.